Cat Head turned 10 years old this year in a place where that’s a long time for a business. 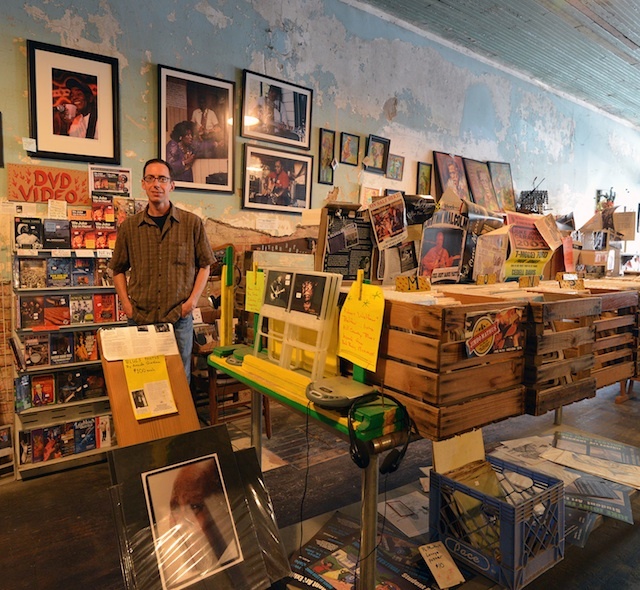 It’s achieved that by cutting out a strong niche for itself as both a commercial enterprise that sells blues music, art and books to visitors and also a community resource that has played, is playing and will continue to play an integral role in the redevelopment, renaissance, whatever you want to call it, of downtown Clarksdale. 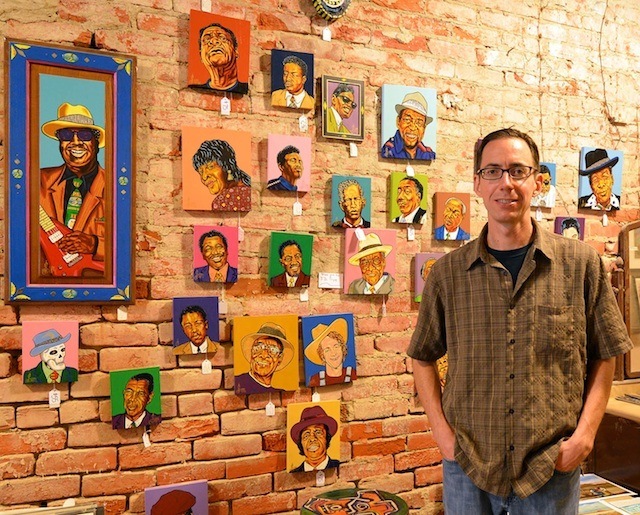 Roger Stolle, founder and proprietor of Cat Head, first showed up in the area in 1995, drawn here by the blues. That seems to be why a lot of visitors show up here the first time. But like many others, once he got here he was seduced by the people and the place itself. He returned the next year and in the course of exploring the region found his way to Junior Kimbrough’s place in Holly Springs. He was warmly welcomed and to hear him tell it then spent a near-hallucinatory night buffeted by the gale force winds of the music, the vibrant art painted on the walls, the booze, the dancing… the works. He wasn’t quite able to process it all until later – after he got the film developed (it was back in those days) and could piece together all the disparate parts that were of the same whole. And when, six years after that, he moved to Clarksdale and opened Cat Head – named, by the way, after the biscuits, the fact that a lot of blues record labels have an animal name in them, and the art of Pat Thomas – that’s what he was selling: the music, the art, books that tried to make sense of it all, but also the intangibles that can’t be sold, the things that make the community so unique and information for visitors on how to find those things and appreciate them. Cat Head is as much about education and community as it is about selling CDs and other stuff. One needs the other to survive, to thrive even. Ten years ago you could just about depend on finding live music in Clarksdale and the surrounding area only on Friday and Saturday nights. Roger worked with local club owners and musicians to expand that, the goal being to have live music available all week long. And it’s just about there. There’s a sense of urgency to it. “Blues the music, the genre will never go away,” says Roger. “But the environment that made the [musicians], only a few of who are still around and who are going fast, is also going. The door [on this authentic tradition] is closing. The festivals help. The Sunflower River Blues & Gospel Festival is using the Bill Graham model – bringing in an international headliner to attract visitors. The Juke Joint Festival is more about involving as much of the local community and businesses as possible. Trying to broaden the area’s appeal to a greater variety of tourists could also help everybody concerned. There’s a lot of scope for cultural tourism based around Tennessee Williams in Clarksdale, the Civil War and also the Civil Rights Movement which hasn’t been much tapped as a source of tourism. Roger’s encouraged by the pace of development in downtown. While he figures it’s been a case of two steps forward, one step back – largely due to the national economy – growth has been stronger than expected over the past few years. In five years he sees a much more resurgent downtown: more music in more venues on a regular basis, a strong restaurant culture, more loft development. What he thinks downtown could really use is more decent but not too expensive short, medium and long term places for visitors to stay, and one good – doesn’t have to be too big, just good – grocery store to service those people. Development of the community, of downtown and its adjacent neighborhoods, and even of the surrounding areas is all part and parcel of what will make Cat Head and other businesses prosper and also help preserve and protect the authentic traditions of the region – to the extent that they can be. And Roger is quite pleased with the sense that he gets that other business people in the area get that and cooperate with each other for the general good. The Delta Bohemian™ would like to thank accomplished author and good friend Eric Stone for yet another contribution to the DB. (You do know that you are now an official Semi-Fixture of Clarksdale, Eric?) We encourage you to check out Eric Stone’s website. Read some of his titillating novels which take place in exotic places in the world. We are thoroughly enjoying Eric’s up-close and personal examination of our beloved Mississippi Delta. Come Back, Eric! Come Back! If you missed it, here is a link to Eric’s highly unique and specific poem video about the Mississippi Delta which he submitted after Juke Joint Festival 2012!